Tabby’s Star has baffled scientists endlessly since it was discovered. It acts like no other star, erratically losing lots of brightness in seemingly random cycles. Friday morning, astrophysicist Tabetha Boyajian from Louisiana State University tweeted that Tabby’s Star had begun to dim again, losing three percent of its radiance (which is quite a bit). Some scientists have suggested that planetary collisions with Tabby’s star might be responsible for these bizarre dips in radiance, and others have proposed that a colossal alien super-structure might be obstructing Tabby’s starlight. The latest event is stirring excitement in the scientific community, because this initial dip could be the start of a greater dimming trend. Two years ago, Boyajian analyzed data from NASA’s Kepler Telescope and found that over a 100-day period the star had dimmed dozens of times, and at one point it lost a whopping 20 percent of its radiance. “All week there were some indications that something might be up, and yesterday we were on yellow alert,” said Penn State astrophysicist Jason Wright, in a live streamed YouTube video. “But nothing was significant enough for us to hit the big red button.” That changed at 4 a.m. this morning, when Louisiana State’s Boyajian received a call from an observatory in Arizona, confirming that the dip was real. 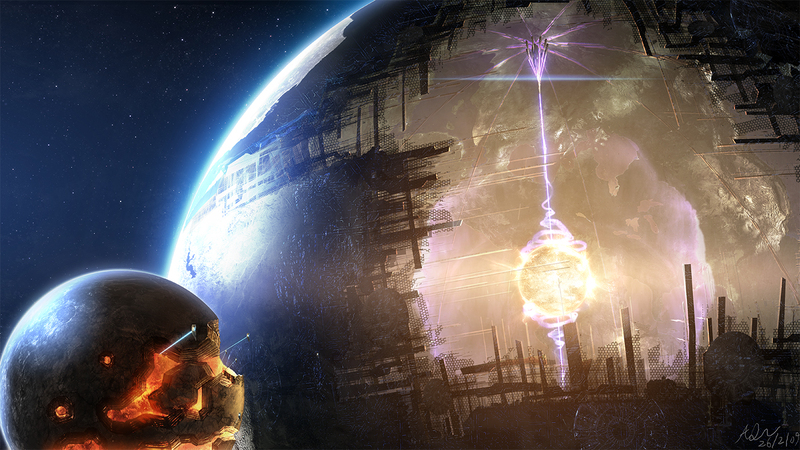 The alien megastructure theory has its roots in 1960’s thought, when legendary astrophysicist Freeman Dyson suggested that advanced civilizations might need a massive amount of energy to power their sophisticated technologies. What better place, thought Dyson, than the energy constantly being emitted from a star. Dyson suggested that the aliens could construct a colossal megastructure around the star, capturing and harnessing its energy. The thinking is that such a structure would likely affect a star’s luminosity, causing it to abruptly dip. Whether big-brained aliens are currently exploiting Tabby’s Star’s energy is uncertain, but whatever the cause, the graph below, tweeted by Boyajian, shows that its brightness is just starting to dip. While the megastructure theory is provocative, scientists have proposed other ideas. In a study released in January, Columbia University astrophysicist Brian Metzger proposed that a planet could have collided with or been pushed dangerously close to Tabby’s Star. In such a case, the sun’s enormous gravity might tear off a hot, chaotic mess of dust and planetary material. This profound amount of orbiting debris might temporarily block some of Tabby’s light from reaching our telescopes. For now, we’ll see if the dimming trend continues, and perhaps ponder, what are those smart aliens doing with all that renewable energy?